Your initial thought when opening the Royal Panda online casino will be WOW! What a bright and happy place, practically begging to be explored. At first glance, it’s not difficult to see that they have taken time and effort to develop a superior website with a complete instant-play interface. Powered by some of the leading names in software development, having an arcade offering more than 300 games, sporting a multilingual website and being doubly licensed and certified, makes this site not only visually pleasing but quite honestly, pretty damn perfect for beginner and professional alike! Royal Panda offers a multitude of methods to fund your account, with most all conventional methods available for example – Visa, MasterCard, Skrill, Neteller, Paysafe card, Agmo, and AstroPay, to name a few. The minimum deposit amount across all methods stands at £10 with the maximum varying from method to method. The most popular banking methods like MasterCard, Visa or e-wallets will have your funds instantly available in your account, and as an extra bonus, this casino doesn’t charge any fees on deposits made. Withdrawals can be made through Bank Transfer, Skrill, Neteller, or Visa/MasterCard. The minimum withdrawable amount stands at £10 and the maximum at £100,000. This casino is reputable for having quick payout periods, and most e-wallet transactions are processed in less than a day. Various currencies are supported by Panda, with USD, EUR, CZK, GBP, MXN, PLN and SEK being a few worth mentioning. As a little cherry on top, all new signups will immediately receive 10 free spins for the very popular video slot, Starburst. 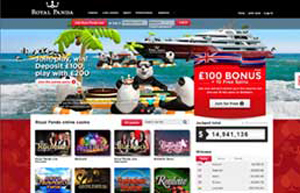 Royal Panda offers all newcomers to the site a 100% matched bonus up to £100 on their first deposit. The playthrough requirements are a super low at just 35x, and while you can play at wager on any game with your bonus, the slots, scratch cards and soft games provides 100% contribution and would therefore allow you to achieve the requirement a lot quicker. It should be noted that the welcome bonus is not available to UK players who use Neteller, Skrill or Paysafecard for their deposit. You won’t be able to get enough of this site and will constantly be returning for more action and fun, and for this fact alone you will be handsomely rewarded with a loyalty AND VIP reward system called the Loyal Panda programme. First off, you will be rewarded one point for every £10-£50 you spend on Royal Panda, dependant on the types of games you play. Secondly, all members are automatically entered into their 4-tier loyalty reward programme, where a set amount of accumulated points automatically advances you to the next level in the programme. It goes without saying that the higher up you move on the loyalty programme, the bigger and better your perks and privileges become. The four tiers are named as follows with their relative amount of points needed: You are automatically entered into the Bronze level when signing up for an account, then move onto Silver with 15,000 points, Gold with 45,000 points, and finally onto Diamond with, 45,000 points. Royal Panda regards the safety and security of their site as top priority and only makes use of certified and secure (HTTPS) servers for processing transactions, which are strongly encrypted. The site also uses an Extended Validation SSL Certificate provided by Comodo, an international frontrunner in online security, and all data on the website is secured through 256-bit encryption. The site itself is powered by a variety of the industry’s finest software and gaming providers, including Microgaming, NetEnt, Evolution, Genesis, Thunderkick and Rabcat. These names in themselves speak volumes about the superb graphics and sounds which is interwoven into all the available games. Besides being one of the most vibrantly designed sites we’ve come across, the platform itself is so incredibly user-friendly that even a complete rookie will be able to navigate and make sense of easily. The casino is entirely web-based with no downloadable software, and instant play is the name of the game. Simply log into your account via your web browser, and you are ready to go! The mobile casino offers a remarkable experience with an impeccable HTML 5 version, which is compatible with most smartphone devices and tablets, such as iPhones, iPads, and Android devices. Royal Panda Casino is the slot addict’s utopia, with a comprehensive collection of NetEnt and Microgaming Quickfire slots, featuring a range of the greatest five-reel bonus slots available. You will find titles like Starburst, Wild Water, and the ever popular Mega Moolah, and in the three-reel slots category you will discover Double Magic, Fruit Fiesta and Fortune Cookie. From the varied assortment of virtual games, you can try your luck at numerous different versions of Roulette, including Multi Wheel Roulette, several options of Blackjack like Atlantic City and Double Exposure, as well as golden oldies like Baccarat, Casino Hold’em and Progressive Caribbean Stud. The casino offers more than seven different variations of video poker developed by both Microgaming and NetEnt and includes names like Tens or Better, Aces and Faces, Jacks or Better, and Bonus Poker Deluxe. Gamers who on the lookout to turn minor wagers into large wins can have a crack at the impressive range of specialty games like Ace, Fortuna, and Triple Wins, as well as scratch cards. All of the 300+ games available on Royal Panda Online Casino are developed by industry-leading companies and are run on an RNG (random number generator) software, ensuring complete objectivity and fair play. There is one more little detail we would like to bring to your attention, and that is the almost unprecedented free-play option on all of Royal Panda’s mobile arcade, giving you the opportunity of testing the games before playing for real money. It all sounds pretty impressive, don’t you think? Any and all questions are encouraged with Royal Panda – knowledge is power after all, so if you need to get in touch, you are welcome to contact their courteous and experienced call centre representatives. The client support staff can be reached through dialling their toll-free number on +356 2778 0418 between 08:00-03:30 (CET), or fill in their call back option form and they will get back to you as soon as possible. Alternatively, you can send them a quick email to [email protected], or make use of their Live Chat feature directly on their website. The website and customer support are offered in multiple languages which include English, German, Swedish, Polish, Spanish, Portuguese, Chinese, Finnish, and Norwegian. There are so many things that we like about this site, and it’s for all these reasons that we have granted them a high-ranking spot on our list of recommended online casino sites for UK players. The site Royal Panda is a breath of fresh air when compared to other stereotypical online casinos. They feature a state-of-the-art platform design, a generous welcome bonus as well as additional promotions, a remarkable selection of awesomely designed games, and an engaging and clued-up customer support team. The onsite navigation between game choices is extremely user-friendly and well thought out, leaving even the most novice player feeling like a pro! The entire site was planned with user convenience and contentment in mind – that’s you – and we can loudly proclaim that they have succeeded on all fronts. So, all that’s now left to do, is register, claim your welcome bonus and be prepared to be treated like royalty! Who owns Royal Panda Casino? The online casino is owned and operated by Malta based Royal Panda Limited. Absolutely. If there was even the slightest hint as to a casino being unfair, it would never make it onto our verified and exclusive recommendation list. Is Royal Panda Casino legit? Absolutely. With the latest safety and security measures in place, 256-bit encryption, numerous available depositing and withdrawal methods, a gallery of more than 300+ games, and with an awesome customer support system in place, we can most certainly recommend Royal Panda as a legitimate gambling establishment.